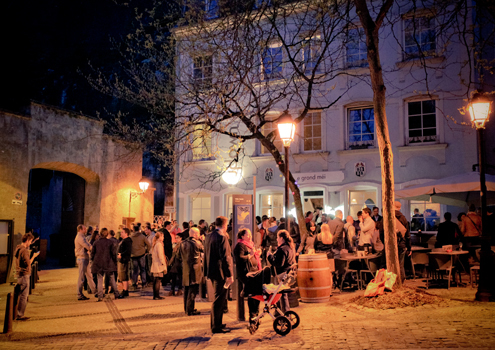 At the foot of the elevator, which leads from the edge of Luxembourg’s old town down to the picturesque Grund, can be found the delightful watering hole known simply as updown bar. This quietly trendy little establishment affords an excellent range of alcoholic and soft drinks, teas, coffees and hot chocolate, perfectly revitalising the intrepid explorer of this Luxembourgian river valley. The ‘cave’, partially hollowed out of the main rock face of this multi levelled city, is the ideal vantage point from which to watch the comings and goings of tourists eager to discover Luxembourg’s secrets. It’s a fine spot both outside in the sunshine, or indoors when the weather is less clement. Friendly staff and excellent service, quite apart from the obvious locational advantages, truly set this little gem apart from its competitors.